Lyndon LaRouche, in handcuffs, being escorted out of the courtroom. Many Americans sat in stunned amazement earlier this month as the venerable New York Times and Special Counsel Robert Mueller's apparatus moved to put the President of the United States, Donald Trump, on trial for treason, because he dared to meet and converse with Russian President Vladimir Putin; because he has referred to NATO as being "obsolete" and questioned its role; and because he fired his director of the FBI, James Comey, as the Constitution prescribes he has the authority to do. Jaws dropped as it became public that top echelons of the FBI, the CIA, and the Democratic Party—all on instructions from British intelligence—had been, and still are to this day, engaged in an active coup d'etat against the elected President of the United States. Many of you reading these lines today are rightly aghast at the fact that these actors, although they have not yet achieved their objective, have so far gotten away with their plot, and that they act with seeming impunity. "How is that possible?" you ask yourself and your friends. And it is because they were able to carry out that legal atrocity against LaRouche 30 years ago, with hardly a whimper of protest from America's leading institutions and most of the American people, that they are at it again today, on a grander scale. There is no exaggeration in that statement. 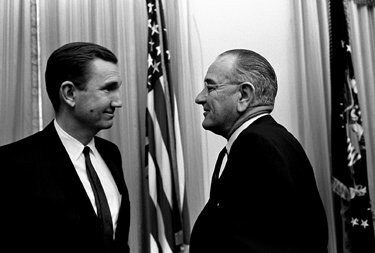 Ramsey Clark, who served as Attorney General of the United States under President Lyndon Johnson, and who also represented LaRouche in his appeals to the Fourth Circuit Court of Appeals and the U.S. Supreme Court, stated in an April 26, 1995 open letter to then Attorney General Janet Reno: "I bring this matter [the LaRouche case] to you directly, because I believe it involves a broader range of deliberate and systematic misconduct and abuse of power over a longer period of time in an effort to destroy a political movement and leader, than any other federal prosecution in my time or to my knowledge." Clark also said: "The purpose can only be seen as destroying— it's more than a political movement, it's more than a political figure; it is those two. But it's a fertile engine of ideas, a common purpose of thinking and studying and analyzing to solve problems, regardless of the impact on the status quo, or on vested interests. It was a deliberate purpose to destroy that at any cost... In what was a complex and pervasive utilization of law enforcement, prosecution, media, and non-governmental organizations focused on destroying an enemy, this case must be number one." With LaRouche's jailing, America and the world were deprived of their most illustrious statesman and economist. Because LaRouche's policies for replacing the deadly looting of Wall Street and the City of London with a just New World Economic Order of universal, high-tech development, were not implemented, hundreds of millions of people around the world remained in poverty and tens of millions perished unnecessarily. It has only been with China's recent adoption of policies very similar to those proposed by LaRouche up to 50 years ago, that the genocide has stopped in at least large parts of the planet. Because LaRouche's SDI policy, as adopted and proposed by President Ronald Reagan in 1983, was sabotaged and not carried out, the world today teeters at the edge of thermonuclear confrontation. Only a return to LaRouche's original design of the SDI ballistic missile defense system—based on new physical principles and cooperation with Russia and China, not against them—can now pull us back from the brink. 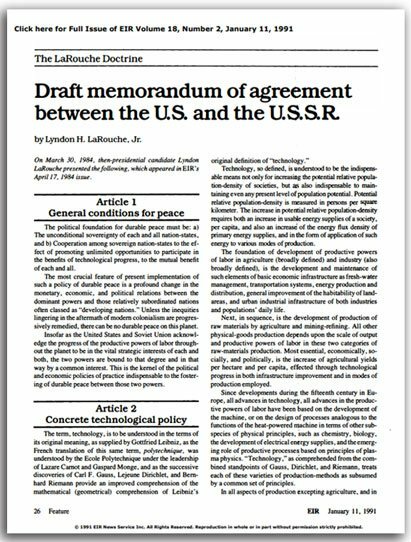 Because LaRouche's proposal for cooperation between East and West after the fall of the Berlin Wall and the reunification of Germany—famously forecast by LaRouche in October 1988—was rejected, and LaRouche was hauled off to jail scarcely three months later, Russia was ravaged and the West looted under Thatcher, Bush, and Mitterand. And a wave of permanent wars was unleashed, which is with us still today. Because LaRouche's proposed war on drugs against London's Dope, Inc. banking apparatus was never implemented, a drug epidemic today is poisoning our nation and the world. And because LaRouche's policies for generating a new Renaissance of classical culture and science were swept aside, we now stare into the pit of hell of a New Dark Age that is engulfing our youth in particular. Some among you may disagree. Some may think that no jailing of a single man, no matter how unjustly, could possibly cause such results. But those thinking that way have yet to understand how real history works, how ideas are the driving force of humanity's advance. In fact, the entire body of LaRouche's life work and his extensive scientific writings, address precisely that central question: the role of man's unique creativity in shaping his own history, and that of the physical universe around him. Read and study LaRouche if you wish to understand why the British Empire so fears him. "The political foundation for durable peace must be: a) The unconditional sovereignty of each and all nation-states, and b) Cooperation among sovereign nation-states to the effect of promoting unlimited opportunities to participate in the benefits of technological progress, to the mutual benefit of each and all. The most crucial feature of present implementation of such a policy of durable peace is a profound change in the monetary, economic, and political relations between the dominant powers and those relatively subordinated nations often classed as 'developing nations.' Unless the inequities lingering in the aftermath of modern colonialism are progressively remedied, there can be no durable peace on this planet. It is time that America atone for tolerating LaRouche's incarceration three decades ago—not because such a terrible injustice was done to LaRouche, but because we have done such a terrible injustice to ourselves, and the world. It is past time to exonerate LaRouche and his associates; but above all, it is time to ensure that LaRouche's policies are at last adopted.